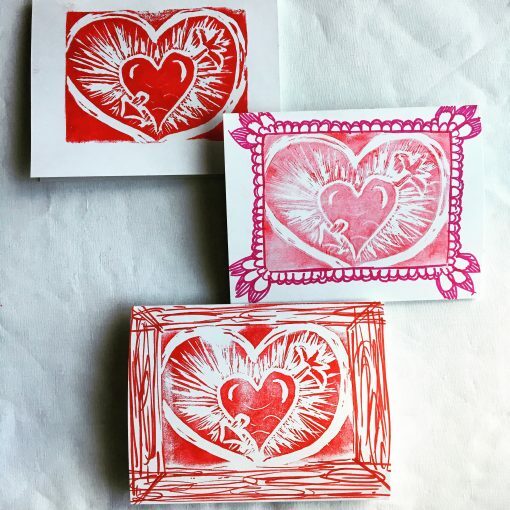 This art class you will learn the art of printmaking just in time for Valentines day. We will be drawing a simple form , a heart and learn how to transfer it to the block. After drawing it on the moo carve or soft block each person will use a carver. Each line carved will add to the design of the heart. After carving away the “negative” space you will ink you block and print from it. You will learn what makes a good print and perfect it making 5 Valentine cards with envelopes. If you choose to bring in an old tee shirt you will have the opportunity to print on fabric as well. All materials and instruction for this 2.5 hour private class are included in the 45 per person ticket. There is also a $25 dollar travel fee. We provide aprons and ask you cover your tables prior to our arrival.